Spokane City Council President Ben Stuckart is pushing new campaign-finance rules for city races. Spokane County, with some exceptions, will no longer ask job applicants about their CRIMINAL RECORD, joining a national push to "ban the box" and give job candidates with convictions a fair chance. Spokane County Commissioners Al French, Josh Kerns and Mary Kuney adopted the policy change last Tuesday. From now on, employment applications for county positions will not ask if a candidate has been convicted by a court of law within the past 10 years. The county will not run a criminal background check on candidates until after it has determined the applicant is otherwise qualified for the position. "We wouldn't want to disqualify a good candidate because of something that happened back in their past," Kerns tells the Inlander. "That was our thought on it." The policy change has been in the works for four or five months, says Tim Hansen, Spokane County human resources director. Hansen says French approached HR then, wanting the department to look into how it could change its policy. Nationwide, 150 cities and counties have adopted ban-the-box policies, according to the National Employment Law Project. The county's policy, Hansen says, is similar to the city of Spokane's policy, changed in 2014. Rick Eichstaedt, executive director of Spokane's Center for Justice, which has pushed for ban-the-box legislation in the private sector statewide, says he was happy to hear about the county's change in policy. He was encouraged that the conservative board of commissioners supported the idea after the mostly liberal Spokane City Council did so years earlier. But so far, efforts to extend ban-the-box legislation to the private sector in Spokane and across the state have failed. And in Spokane County, it's unlikely that county commissioners would support such legislation, either. While the nation focuses on veterans with a national holiday on Nov. 11, the city of Spokane will spend the entire month honoring and helping veterans, especially those who are homeless, says Mayor David Condon. "Our veterans come from all branches of the military and all eras of conflict," Condon announced at Goodwill Industries of the Inland Northwest on Oct. 30. "Some are struggling to maintain a safe roof over their head, put food on their tables, meet the basic necessities that you and I enjoy, and earn a stable income." The city and Goodwill hope to help HOMELESS VETERANS transitioning into permanent housing by providing them with the things they need to live on their own, such as towels, toilet paper, personal care items and sheets. That's where you come in: Donations for those items and more will be accepted from Nov. 8 through Nov. 22 at area Goodwill locations, then passed on to veteran households in need. In addition to that work, Goodwill's regional veteran housing program is working to find more landlords who are willing to rent through the program. If you're a landlord, you can call 509-321-3348 for more information. The programs have helped veterans like Walter Martin, who says he came to Spokane on Sept. 5. "I was hurting. I just needed help, and when I got to Spokane, I went to the UGM and they were instrumental in getting me plugged in with all the resources," Martin says during the city announcement Monday. "But what really helped out was going to the Spokane regional county office, and from there, everything just blossomed." Martin says he got help with everything from a bus pass to health care, housing and employment, and he hopes that after getting his own life sorted out, he can give back. 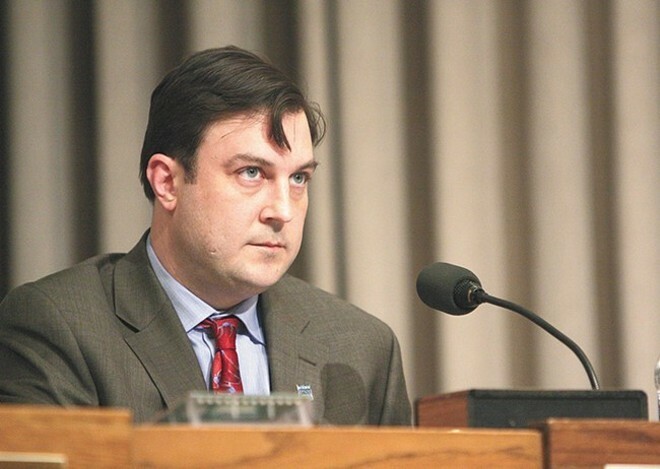 The "democracy voucher" initiative City Council President Ben Stuckart backed last year was crushed at the ballot box; now, Stuckart is pushing a new proposal: a dramatic overhaul of CAMPAIGN FINANCE rules for the Spokane City Council, mayoral and municipal court races. First, the cap on individual donations would be cut in half, allowing only $500 to be given in the primary and $500 in the general election for each race. The cap would also apply to state parties: Unlike in 2011, the Washington State GOP wouldn't be able to dump $63,000 into the mayor's race at the last minute. Third, it would require more transparency: Political committees would have to report their three biggest individual contributors on their advertisements; no more hiding the source of your donations by laundering them through several committees. Finally, it would dramatically constrain the fundraising window: Candidates could only accept campaign contributions in the year the election is held. And yes, if Stuckart ends up running for mayor in 2019 after all, his new proposed rules could impact his race. "I'm cutting my own knees off if that's true," Stuckart says. "If I'm going to announce for mayor, it's gotta be next year. And then I'm going to be announcing for mayor and not be able to raise money and use my built-in advantage." Stuckart argues that current office holders would be hurt by his reforms, because incumbents have a long time to raise money and can more easily raise money from contractors. Michael Cathcart, director of the pro-business political nonprofit Better Spokane, says Stuckart is wrong.